The Legionella and the installation of cooling towers with water. In Quebec and elsewhere in the world, the majority of legionellosis cases are caused by Legionella pneumophila. Infection with legionella is called legionellosis. 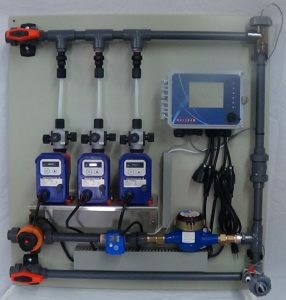 Walchem water tower controllers are designed to control the chemical program of your water tower. Reading of the conductivity and / or disinfection rate by OPR or PPM amperometric probe, control of the purge valve, control of oxidizing or non-oxidizing products, control of corrosion inhibitor based on Water or both, with an accurate measuring element based on the fluorescence emitted by the chemical and captured by the sensor. Some models can be uploaded on the Internet and send you alarms, data acquisition files. You can connect directly to your controller if you were there. V-Touch integrates these controllers on their centralized platform. Everything becomes easy and gives you unrivaled performance.